The Parent, Teacher and Friends Association's aim is to work together to help the school, we want to help our community and the children understand the idea of community and its importance in the life of a Catholic school. To do this we give up our time to raise money to provide equipment for a better school experience for the children of the school. This hopefully aids the teachers to resource learning activities that might not otherwise be possible. There are lots of us that are happy to give up our time and we are enthusiastic to help run events alongside the staff of the school. We welcome and encourage new members to come along and participate in events. Handing over our fundraising cheque. 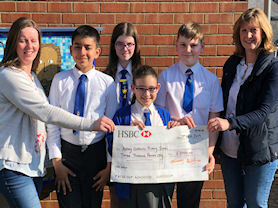 On 29th March 2019, our PTFA chairs presented a cheque to members of our Pupil Parliament. The cheque for £3000 was the final instalment to supporting payment towards our wonderful Reception Outdoor Learning Area. Thank you to all who are involved in organising and supporting PTFA events. 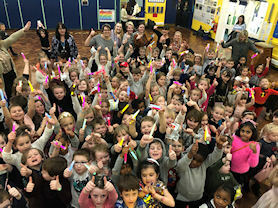 Our wonderful PTFA organise a series of discos each year to fundraise. During 2018/19 we have already enjoyed some fabulous disco evenings which wouldn’t be possible without our amazing PTFA and staff. On 31st January 2019 our youngest pupils enjoyed their special evening. We look forward to many more. On the 29th January 2018, our fabulous PTFA presented school with a cheque for £3,000 towards our new Reception Outdoor Learning area. The PTFA are working hard to raise another £6000 to fund this brilliant project. Thank you to everyone who supports the PTFA in their fundraising. 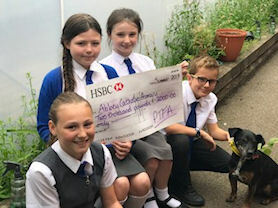 A cheque from our PTFA. Thank you very much to our wonderful PTFA and their amazing fundraising. The cheque for £2000 presented in Summer 2017 has contributed towards our defibrillator and our new children's entrance welcome sign. Huge thanks to the PTFA who presented school with a cheque for £1,600 in March. Thank you to all those who work with the PTFA fundraising and constantly working behind the scenes to support our school. Thank you to all families who have supported PTFA events and fundraising. The £1,600 has been used to purchase kindles and balance bikes for school. 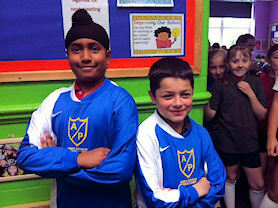 Pupils modelling our new Football kit. The PTA were delighted to purchase new football kits that will be put to good use in the forthcoming matches. Lets hope that the teams continue to go from strength to strength in their new kits! 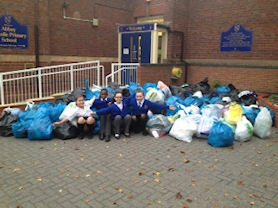 Look how many we collected! Each term the PTA organise a Bags2School collection. Each family are given a large plastic bag to fill with unwanted clothes and shoes. The bags are collected and school receive funds based on the weight of the bags. Our collection in November 2011 was so well supported that the collection company had to pick up twice as the bags could not fit in one lorry! Thank you to all families and friends of school for supporting us. 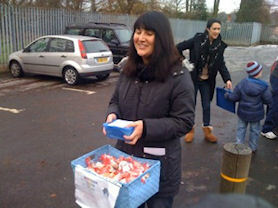 Members of the PTA gave up their time to sell Reindeer Food to raise funds for equipment used by children at breaktimes.